“We know we’re a critical element for the Mars Program to support other missions for the long haul, so we’re finding ways to extend the spacecraft’s life,” said MRO Project Manager Dan Johnston of NASA’s Jet Propulsion Laboratory, Pasadena, California. “In flight operations, our emphasis is on minimizing risk to the spacecraft while carrying out an ambitious scientific and programmatic plan.” JPL partners with Lockheed Martin Space, Denver, in operating the spacecraft. MRO continues to investigate Mars with all six of the orbiter’s science instruments, a decade after what was initially planned as a two-year science mission to be followed by a two-year relay mission. More than 1,200 scientific publications have been based on MRO observations. Teams operating the two instruments named most often in research papers — the High Resolution Imaging Science Experiment (HiRISE) camera and the Compact Reconnaissance Imaging Spectrometer for Mars (CRISM) mineral-mapper — are dealing with challenges but are ready to continue providing valuable observations. 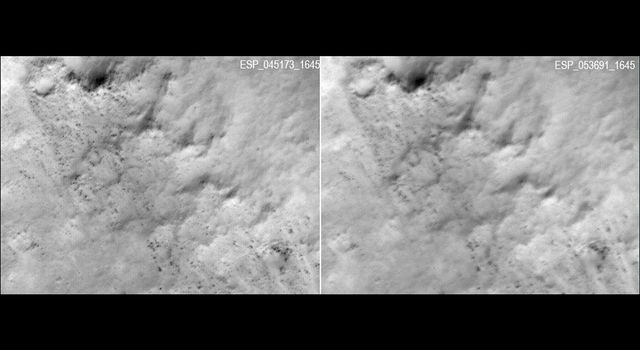 This entry was posted in Reports and tagged Compact Reconnaissance Imaging Spectrometer for Mars, Context Camera, CRISM, CTX, HiRISE, igh Resolution Imaging Science Experiment, Malin Space Science Systems, MARCI, Mars Climate Sounder, Mars Color Imager, Mars Reconnaissance Orbiter, MCS, MRO, MSSS, NASA, Shallow Radar, SHARAD, University of Arizona. Bookmark the permalink.